Recording high quality sound at noisy outdoor locations can be a real challenge for videographers. Here is some advice on using shotgun microphones to help ensure that location sound is not only useable, but of top quality. Face it. In most motion pictures, virtually all location sound is re-recorded in a studio or on a Foley stage after the initial production. 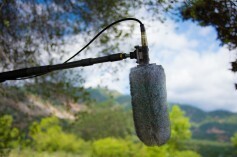 That’s because location sound, by its nature, is very iffy and difficult for anyone to record. However, when on a low budget, re-recording is often not an option. Getting it right the first time is essential. Perhaps the most important rule in location recording is to avoid getting the sounds (and/or noises) that you don’t want. This preventative step is virtually always accomplished with the proper use of a unidirectional shotgun microphone equipped with proper protection from the wind. A shotgun mic is designed to capture sounds in front of it. It rejects sound from the back and sides. Placement of the shotgun, while monitoring the sound on headphones, is essential stuff for any location sound recordist doing his or her job. The shotgun microphone got its name because the long, slotted tube in front of the microphone cartridge makes it resemble a shotgun. 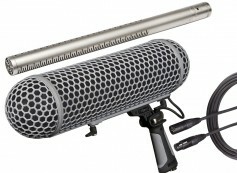 This “interference tube” makes shotgun mics significantly less sensitive to sound coming from the side and rear than other directional microphones. A shotgun mic’s extremely directional pickup pattern (called a line/gradient pattern) makes it popular for location production. A common misconception with shotgun mics is that they magically reach out and grab the sound coming from a source. These mics are not telephoto lenses for sound or amplifiers. They do not allow users to zoom in on a conversation 100 feet away. In reality, Shure, a veteran maker of shotgun mics, says that all shotguns merely reject more of the undesirable off-axis sound. This could be noise from a busy street or excessive room sound in a space where dialog is being recorded. Shotguns reduce the reflected room sound that comes into the mic off-axis. In practice, a shotgun microphone can typically be placed at four to five times the acceptable distance for a standard omnidirectional microphone. However, make sure to keep in mind that the shotgun mic will also pick up some sounds coming from behind the subject. With shotgun mics, as with everything else, you get what you pay for. Sennheiser’s MKH 416 ($1249.95), a longtime staple of professional sound operators, is a compact pressure-gradient microphone with a short interference tube. Because it’s an RF condenser design, it’s immune from environmental conditions, which can be very important to location crews who must be able to work in any climate. It features high directivity, low self noise, high consonant articulation and feedback rejection. Another popular shotgun is Rode’s NTG3 ($699), who’s RF bias technology also makes it almost completely resistant to moisture. This, again, can be a life-saver on humid, hot summer days when crews are moving from air conditioned rooms to sweltering outdoor heat. Though both Sennheiser and Rode, as well as many other manufacturers, make lower-cost electret condenser microphones, these mics should come with a warning. Though the quality is excellent and many are capable of being powered by internal batteries, electret condensers may be adversely affected by extremes of temperature and humidity which can cause them to become noisy or even temporarily fail. Know the difference between these microphones and choose accordingly. If extreme weather conditions are not encountered by your crew, electret condensers are a fine choice. Electret condensers have a permanent charge, maintained by a special material deposited on the backplate or on the diaphragm. That’s why these mics can be powered by batteries. Non-electret type shotguns are charged (polarized) by means of an external power source, usually 48-volt phantom power. It may be a downside for some crews, but the environmental benefits counter it for the right user. Most good condenser shotguns of all types have higher sensitivity and provide a smoother, more natural sound — particularly at high frequencies. Flat frequency response and extended frequency range are much easier to obtain in a condenser. When faced with capturing clean audio in noisy environments, pick the right equipment and protect it well from wind. Good wind protection is essential, since high wind can easily destroy any recording. And monitor the sound with good headphones. Without headphones, you are flying blind. 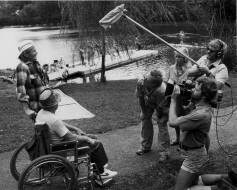 Even when equipped with the best gear, location sound recording is always challenging. There are always plenty of “gotcha” moments that challenge the skill level of even the most experienced operator. Very often it comes down to using common sense — coupled with years of practical skill — to avoid problems and come away with excellent sound.